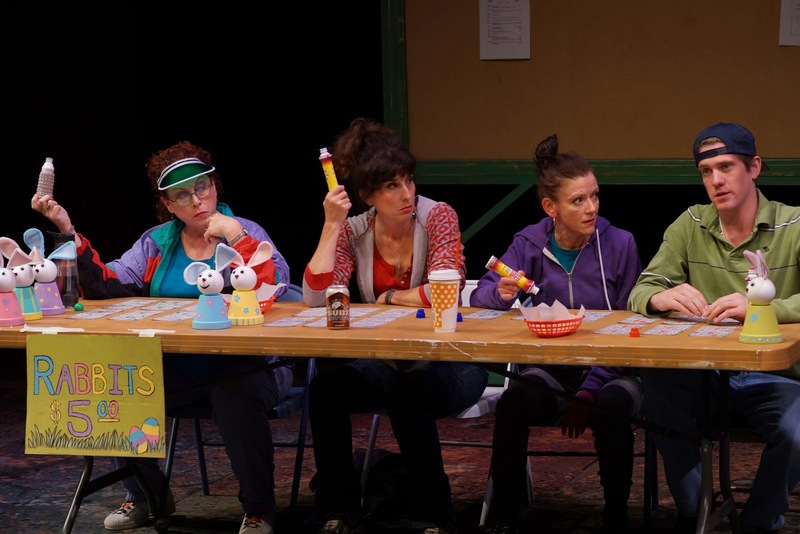 The first production of Park Square Theatre's 2013-2014 season is the new play Good People, which had a short run on Broadway in 2011 (but long enough to win Frances McDormand a Tony). Written by David Lindsay-Abaire, it's sharp, funny, intense, and heart-breaking at times, full of complex characters, most of whom are not particularly likeable, but are certainly entertaining. The tone is reminiscent of Lindsay-Abaire's most well-known play Rabbit Hole; both deal with some pretty heavy issues with realism and humor. Joel Sass directs a solid cast of six (and designed the beautiful set), who bring to life this complicated story with its issues of class and gender, echoing the real-life stories heard on the nightly news. Good People is centered around the tough and vulnerable Margaret (a strong performance by Virginia S. Burke) as she's fired for her job as cashier at a dollar store by Stevie (Sam Pearson, making the most of the small role). Margaret is a single mother of a developmentally disabled adult daughter and has never been able to climb out of the lower-class life into which she was born. With the help of her friends (scene stealers Jane Hammill and Angela Timberman) she decides to approach childhood friend Mike (James Denton, best known as another very different Mike on Desperate Housewives, making his welcome debut on the Minnesota stage). Unlike Margaret, Mike has gotten out of South Boston and is now a wealthy doctor with a young wife and daughter and a seemingly perfect life. He's unable to offer Margaret a job, but he does reluctantly invite her to his birthday party at his home in the nice part of town. Margaret shows up at his house and meets his wife Kate (an appropriately polished Hope Cervantes), where the pleasant reminiscing about the good old days turns ugly when they discuss why one of them was able to "get out of Southie" while the other wasn't. It's not just "hard work" as Mike says, but also good luck, family support, and gender privilege (sometimes it's easier for a man to leave his past behind than it is for a woman to leave hers behind). This second-act discussion is almost too intense; it feels like you're eavesdropping on a very personal argument. The cast works together very well, and despite only having three weeks of rehearsal they realistically act as old friends, and have conquered the South Boston accent. 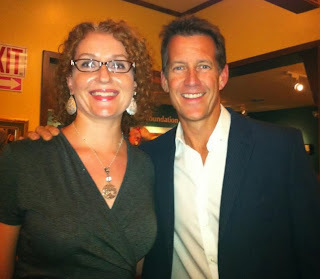 James Denton fits in well with our local theater actors and I was happy to discover that his natural charm on-screen translates to the stage. But Virginia Burke is the star of this show; her layered performance as Margaret makes you sympathize with her despite some questionable choices. 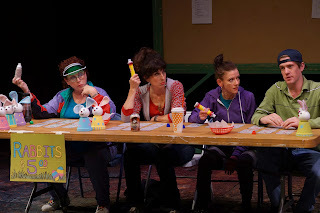 The rapport between the three Southie women is priceless as they bicker, cajole, and support each other, particularly in the highly entertaining bingo scenes. Angela Timbermann never fails to crack me up, as Miss Hannigan or Scrooge's boozy housekeeper, and this play is no exception (in fact I think she was cracking up some of her castmates as well). There are plenty of laughs to balance out the uncomfortably intense confrontations. Director Joel Sass (who often works at the Jungle Theater, which has the best sets in town) designed this very cool set, which is actually comprised of five very different sets that float on and off stage, four of which only appear once. All are detailed and realistic, from a garbage-strewn alley to a downtown doctor's office, from a very lived-in kitchen to a pristine upper class living room. As each scene ends, the set moves away and reveals another behind it, as we peel back the layers of the story. 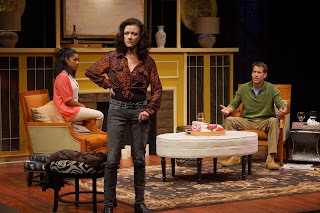 A well-written and relevant new play, a great cast that plays well together, and excellent set design - another winner for Park Square Theater (playing now through October 6). I couldn't resist a photo op with Jamie! You can also catch him as host of the Ivey's pre-show party.